Oracles Fire is the third and final instalment in Mary Victorias opening opus "Chronicles of the Tree" (yes, she is working on new projects). Unlike either of the preceding volumes, Tymons Flight and Samihas Song, this is not a standalone novel  knowledge of what went before is essential to get the most out of this book. This need to know what went before also means that Oracles Fire is difficult to review in isolation to the rest of the series. For the reader Oracles Fire is a natural extension of Samihas Song, there is no perceptible pause in the narrative flow between these two books. Samiha has been cast into the storm below canopy, Tymon has passed Samihas testament to the Jays but been captured by the Argosian guards, and Jedda has broken with the Envoy and Wick and is now friendless and wandering the central canopy alone in mid-winter. The future looks even bleaker than it is now for the eastern canopy. 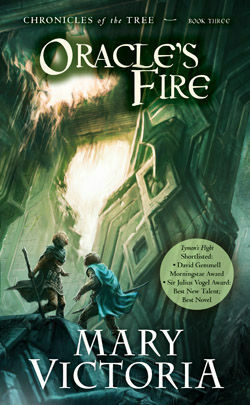 While on one hand Oracles Fire completes the story of Tymon, Samiha and Jedda on the other hand the book is also about what happens when one gets to a journeys end, because for each of these characters they complete their journeys and still must make decisions about their futures: the journey didnt solve all that was wrong with their personal world. The reader also gets to find out the conclusion to the struggle between the masters and the oracle, and how life fares for other characters but the principal focus (as it should be) is on the three leads and their struggles with their adversaries  and struggles there are aplenty. I found Oracles Fire a very fitting and satisfying conclusion to the story begun in Tymons Flight and not an ending I would have predicted at the outset of the saga. This is a series I have, and shall continue to, recommended to readers looking for something beyond the standard sword and sandal epic as the reward is in the reading. As a meal this series is lamb tagine and couscous, not hamburger and chips. Mint tea anyone?